Gain a wildlife ‘Track and Sign’ qualification during 10 fantastic days in the South African bush. Ask most guides what their favourite subject is when working in the bush and chances are they’ll say “Tracking”. This is certainly the case as far as Jared and Alex are concerned. Both have been taught by Colin Patrick who is widely regarded as one of the best trackers in Southern Africa. Such is his skill and knowledge that he regularly runs courses for South African National Parks to train their Rangers in Man Tracking. 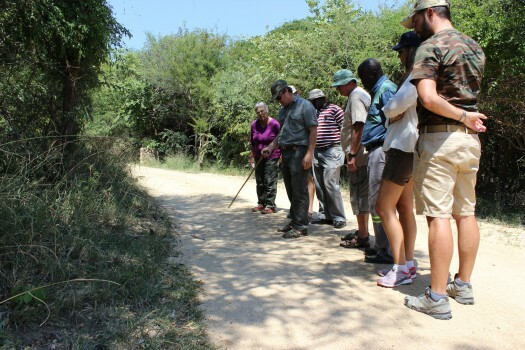 We have combined this Track and Sign Course with a two night stay in Kruger National Park to bring you one of the best wildlife experiences you could dream of. Only 8 clients per course, so spaces go quickly. Get in touch for details of how to book. You will be met at Johannesburg airport by either Jared or Alex and transported to The training facility at Mountain View in Limpopo Province. Upon arrival you will have the rest of the day to relax and enjoy your surroundings. As a welcome you will dine in the bush tonight!! Evaluation Day. Now we will see what you have learned. The assessment takes pretty much the whole day, but is an enjoyable experience. At the end of it you will find out if you have achieved the required pass mark to be awarded a Track and Sign Level. You should remember there is NO fail….. even if you do not reach a certain percentage you will still be going away from the course with a vast amount of knowledge that you didn’t have previously. You will be accommodated in comfortable thatched chalets, which have all the normal amenities. The night after the evaluation is spent sleeping under the stars in the African bush. This is normally one of the highlights of the course, but be warned – sleeping usually isn’t much of a priority as you listen to the sounds of the bush throughout the night. We say our goodbyes to the Moholoholo team and head out to Kruger National Park. A big favourite for tourists and Wildlife Guides alike. We will enter via the closest gate at Orpen to give us maximum time in the park. 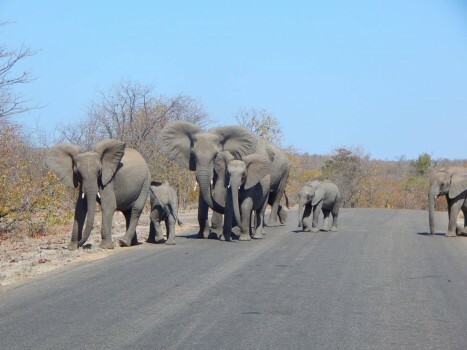 On arrival at your camp, and once you’re settled, we will spend time driving around the many roads spotting wildlife. We are not allowed to drive inside the park after dark, but you are able to book with the park to go out on one of their own guided night drives. Another day spent exploring the Kruger National Park with your guide, or alternatively you can simply spend the day relaxing at the camp. Either way you will be absorbing the wonders of the African Bush. An early morning start so that we can get you back to Johannesburg for your return flight home. Unless of course you wish to extend your visit, in which case we will be happy to help you plan.